There is no change to the risk budget this month. 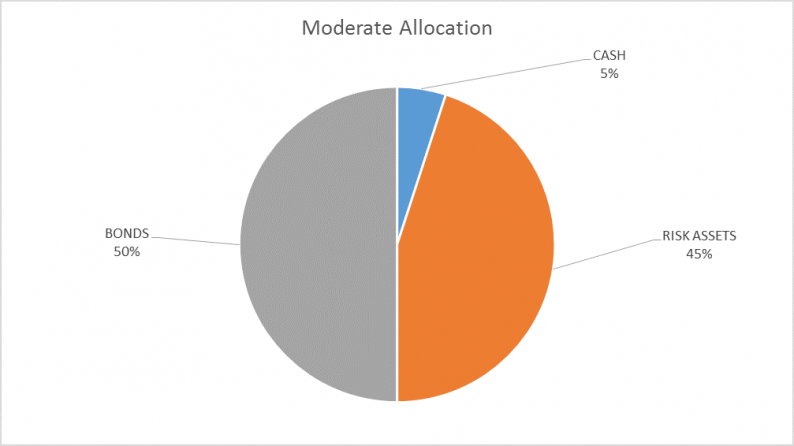 For the moderate risk investor, the allocation to bonds is 50%, risk assets 45% and cash 5%. Stocks continued their erratic ways since the last update with another test of the February lows that are holding – for now. While we believe growth expectations are moderating somewhat (see the Bi-Weekly Economic Review) the change isn’t sufficient to warrant an asset allocation change. The job creators in our districts…have suggested to us for months now that the biggest obstacle to economic recovery and job creation is the policy uncertainty created by Washington. Some of the kvetching was nothing more than partisan political rhetoric but there is an element of truth to it as well. Business owners need some level of confidence that they aren’t going to get up tomorrow and find that some new government policy has laid waste to their carefully considered plans. On the other hand, I don’t think most business people are sitting around waiting to hear from their Congressperson before executing their business plan. If they even have a business plan or consider government policy at all. There’s something about the real world problems of running and growing a business, meeting payroll and trying to figure out how to beat your competitors that renders all business plans ridiculous and most government policies an afterthought. We haven’t heard much about uncertainty from Republicans recently. Now it is the Democrats turn to point to the Oval Office and opine about the plight of the business person trying to figure out what will emanate from the Presidential twitter account next. Tariffs, trade wars, Syria, Russia and immigration, not to mention the once unmentionable rumors surrounding the President’s personal life. Surely, if there was uncertainty under the Obama administration it must be multiplied under President Trump, right?